Taonius borealis, known only from the temperate and boreal North Pacific, reaches a maximum size of 50 cm ML (Nesis, 1972). Largest club sucker with one primary hook-like tooth and about 6-8 secondary hook-like teeth. Arms short, about 1/4 of ML. Largest arm sucker-rings with low, truncated closely-set teeth on distal half or all around. figure. 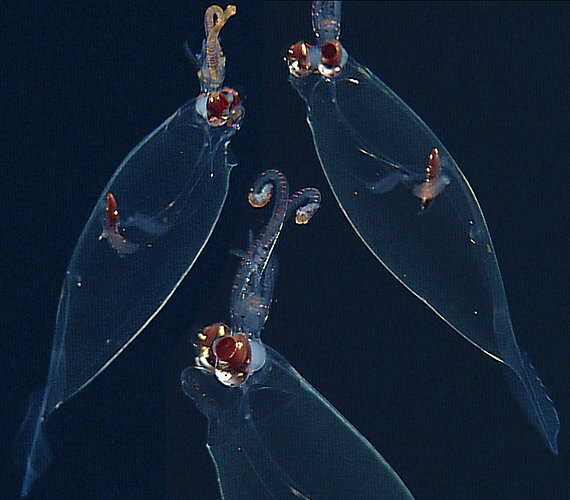 Large arm suckers of T. borealis. Left - Distal-oral view of whole sucker (sucker 11 of arm II, 240 mm ML). 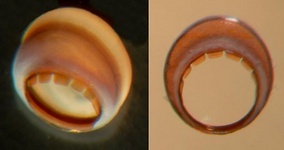 Middle - Oral view of inner ring of same sucker. Right - Oral view of whole sucker (arm III, about 300 mm ML). Photographs by R. Young. Largest two suckers of medial two series of club manus with one enlarged, hook-like tooth; 3-4 smaller secondary teeth present. Other enlarged suckers of medial series of club manus with two largest hook-like teeth more nearly equal in size; 6-8 (total) smaller secondary teeth present. Tentacular stalk with two series of locking suckers on distal 2/3 to 3/4 of stalk. Distinct carpal cluster at base of manus with 6-7 smooth ringed suckers and matching knobs; knobs not always obvious. Figure. Manus suckers from T. borealis, male, about 300 mm ML, central temperate North Pacific. Left three - Three views of the largest medial manus sucker. Right two - Two views of a large marginal manus sucker. Figure. Sucker from medial series of club dactylus of T. borealis, immature female, about 350 mm ML. Left two - Two views of the intact sucker. Right - Same sucker outer ring removed. Photographs by R. Young. Skin dermis adjacent to the muscular mantle with alveolate structure (in large males only?). Fins lanceolate, about twice as long as combined width; 1/3 of ML. 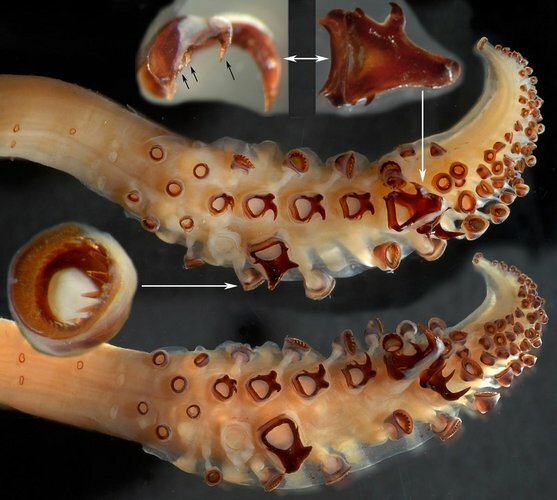 The following photographs provide a close-up view of the head and arms and show the arrangement of occular photophores and arm suckers. Figure. Head and arms of T. borealis. Left - Ventral view. Right - Dorsal view. Note the orange photosensitive vesicles on the "brain" within the cephalic cartilage; the skin has been removed from this area. Photographs by Henk-Jan Hoving. Paralarval stages of T. borealis are unknown. Below are photographs of T. borealis apparently in transition between paralarval and juvenile stages as indicated by the shape of the eyes. Figure. Left - Ventral view of a young T. borealis. Right - Composite of three photographs of the same individual showing the shape of the eyes that appear to be in transition from an eliiptical to a tubular or to a hemispherical shape. © 2013 MBARI . 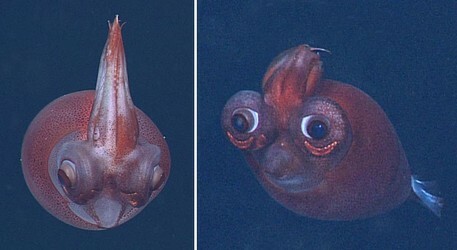 Species of Taonius typically have eyes directed forward. However, they are quite capable of directing the eyes laterally as well as can be seen by the different eye orientations in the two insitu photographs below of a single T. borealis taken within seconds of each other. Figure. 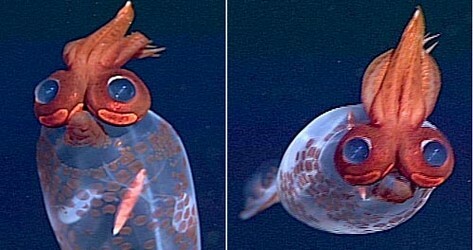 Two photographs of the same T. borealis showing eye orientation. Left - Anterior view with laterally oriented eyes. Right - Anterior-oblique view with anteriorly oriented eyes. 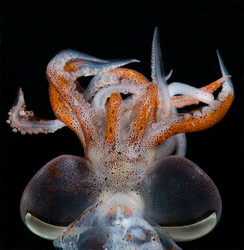 Photographs © 2011 MBARI. Type locality: Western North Pacific at 44°7.8'N, 150°26.7'E. T. borealis is found the temperate and boreal North Pacific to as far south as Southern California in the Eastern North Pacific. Akimushkin, I.I. 1963. 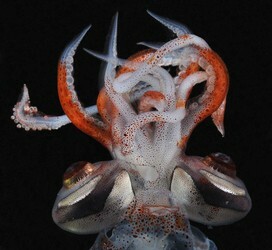 Cephalopods of the Seas of the U.S.S.R. Academy of Sciences of the U.S.S.R., Institute of Oceanology, Moscow, 235 pages. English translation: Israel Program for Scientific Translations, Jerusalem, 1965. Taken by an ROV of the Monterey Bay Aquarium Research Institute. Page: Tree of Life Taonius borealis (Nesis, 1972). Authored by Richard E. Young. The TEXT of this page is licensed under the Creative Commons Attribution-NonCommercial License - Version 3.0. Note that images and other media featured on this page are each governed by their own license, and they may or may not be available for reuse. Click on an image or a media link to access the media data window, which provides the relevant licensing information. For the general terms and conditions of ToL material reuse and redistribution, please see the Tree of Life Copyright Policies.